Fourth Row Center: Film Writings by Jason Bailey: On DVD: "Patton Oswalt: Finest Hour"
Patton Oswalt’s first half-hour HBO special a decade and a half ago (I’m as surprised as you) marked the arrival of a unique comic voice, one that would, in the subsequent years, assume a place alongside Louis C.K., Chris Rock, and Eddie Izzard as one of the foremost working practitioners of the art. Along the way, he continued to develop a specific comedic style, deftly mixing generous portions of pop culture geekery with trenchant political commentary, absurdist flights of fancy, and occasional confessional sidebars. But we geeks must grow up, and Oswalt did; he was married in 2005 and had his first child two years ago. His 2009 special, My Weakness is Strong, saw a subtle but noteworthy shift in the focus of his material, as concerns of marriage and impending fatherhood started to work his way into the act. The Oswalt of his new special, Finest Hour (which first aired last fall on Showtime), has pivoted further towards these themes—but, thankfully, without abandoning his distinctive persona or welcome edge. Sure, there are stories of fatherhood: running “daddy errands”; realizing that his parenting choices come off, to his mother, as criticisms of hers; engaging in impromptu “dance parties” with his daughter. But Oswalt hasn’t transformed into some kind of insufferable daddy comedian, or even shifted to predominately family-focused material (a la Ray Romano). He’s still dealing with the same insecurities (when his mother insists that, via her methods, he “turned out just fine,” he tells the audience, “I let that go. I don’t have four hours”); he’s still capable of taking the mundane and coming up with an ingenious pop analogy (as when he compares his immediately-winded dancing with his daughter to a bloated Axl Rose’s performance at the VMAs). To his credit, Oswalt proves himself a comic who is still taking chances and still evolving, even when he could easily rest or coast. 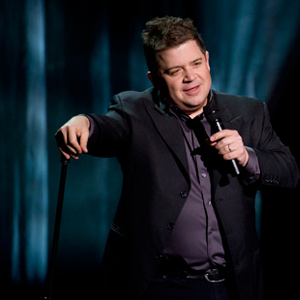 Patton Oswalt: Finest Hour doesn’t quite live up to its title (that honor still probably goes to his untouchable first album, Feelin’ Kinda Patton), but it is still an outstanding hour-plus of stand-up from one of the best in the business. "Patton Oswalt: Finest Hour" is out tomorrow on DVD. For full A/V and bonus feature details, read this review on DVD Talk.